Eurocom has launched and is now shipping the 15.6” Shark 4 Ultraportable laptop with NVIDIA GeForce GTX 960M graphics with 2 GB GDDR5, Intel Core i7-4720HQ processor and an optical drive, all in a slim 1.1 inch chassis. “The EUROCOM Shark 4 is another impressive addition to our line of thin and light upgradeable, ultraportable laptops designed to offer high levels of performance in addition to sleek and classy designs as well as ultra-portability and ease of use.” Mark Bialic, Eurocom President. Upgradeability is a core tenet of all Eurocom systems; the Shark 4 is no different with upgradeable memory, storage, display, wireless card and keyboard. The EUROCOM Shark 4 supports two memory modules for up to 16 GB of DDR3-1600 memory and one M.2 SSD SATA PCIe Gen2 x2/x4 and two 9.5 mm HDD/SSD SATA for up to 2.512 TB of storage. Graphics performance comes from an NVIDIA GeForce GTX 960M with 2 GB GDDR5 memory and Intel HD Graphics 4600. The GPUs are switchable between iGPU and dGPU using Microsoft Hybrid Graphics to give customers great performance and outstanding battery life. 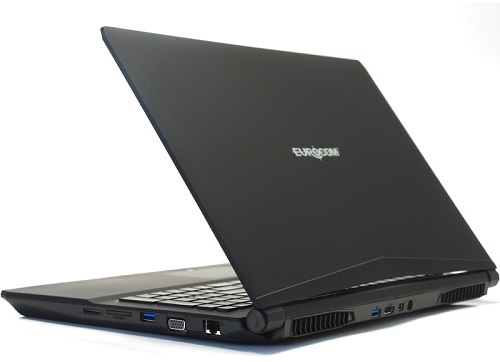 The EUROCOM Shark 4 has an Intel HM87 Express Chipset running the Intel Core i7 4720HQ processor with 4 cores, 8 threads running at 2.6 GHz with integrated Intel® HD Graphics 4600. Due to Hyper-Threading, the four cores can handle up to eight threads in parallel leading to better overall utilization of the CPU. The i7-4720HQ is rated at a TDP of 47 W including graphics card and memory controller. The increased security, brought on by the TPM 2.0 can save organizations and individuals in IT management costs. The Shark 4 is prewired for LTE or UMTS/HSPA+ M.2 3042 card module support, through an M.2 slot, so users can have a reliable internet connection on the go. The Shark 4 comes with a full range, slim design, 120 W 19.5V, and 6.15A AC Adapter and a 6 Cells, 62 WH Smart Lithium-Ion battery pack which will give users 280 minutes of power on the go. Run up to 3 active displays with the 15.6” 1920x1080 ips edp display and the HDMI, VGA and Mini DP ports. The Eurocom Control Center gives users complete control over their Shark 4 by allowing them to control the performance, system fans, power saving and entertainment. In addition to the Control Center, the Shark 4 also has the Sound Blaster Cinema 2 application to allow user control over the sounds system. The EUROCOM Shark 4 has a streamlined “V” design theme for a sleek looking chassis that is just over 1 inch thick and weighs only 2.5 kg so users can easily slip the Shark into their backpack or handbag.